The prototype application will be for devices that run iOS 5. We are developing a proof of concept and can look at developing for a wider range of devices in the future. The best case scenario means that users can scan barcodes with the camera on their iOS device. In reality, this will only be possible with the iPhone (3GS, 4 and 4S). The iPod Touch and iPad 2 have a fixed focus camera that isn’t suitable for scanning nearby objects. In fact, the Open Source ZBar bar code library we are using says that these devices aren’t supported. The original iPad and older iPod touches have no camera. Even for those devices with suitable cameras, the barcode may be faint or damaged . We therefore need to allow for the manual entry of barcodes via a keyboard. 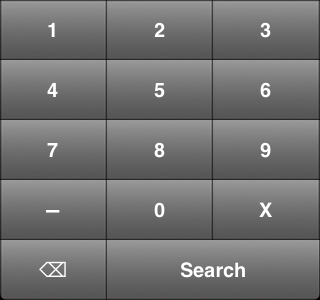 In iOS you have a number of prebuilt keypad layouts, including default (standard keyboard), email (standard keyboard with an at sign and period) and numeric. The closest suitable pre-built keyboard was numeric (0 – 9, Delete). However, I also need to accommodate the characters ‘x’ and ‘-‘. We don’t actually need the dash (‘-‘) for searching ISBN numbers, but I thought it would be less confusing to allow the user to enter the character if it was on the back of a book. 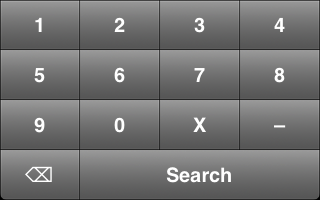 This is more familiar and has larger buttons – especially useful for people with clumsy fingers like myself. Any thoughts and suggestions welcome :). Based on some feedback I’ve increased the size of the X. I’ve also nudged up the size of the dash. The different shade of grey is an artefact of the way I took the screenshot, I think. Posted in User Interface and tagged development, ios, user interface on 2012/03/05 by Mike Jones. Hey Mike. All I can say is I agree with the decisions you’ve made here. The 3 buttons across is right as it ties to what people are naturally used to and I think bigger buttons are a better move anyway so it’s a nice bonus that you get that from forcing the 3 across approach. I think you’re also right to place the “x” button on the right too as then it’s not on top of the delete button which has its own “x”. Best to have distance between the two. Thanks for the comments. 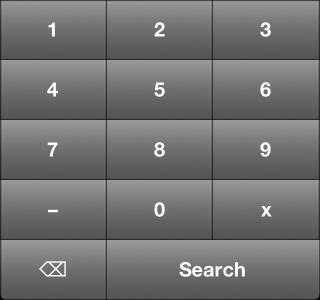 I’ve updated the keyboard to increase the size of the X. I’ve also slightly nudged up the size go the dash. Thanks Mike. Your updated version with X the same size as the letters and larger dash looks fine to me and an improvement on the other versions. I’m hoping the context will make sense and people won’t think “calculator”. It will be on a screen with a text field and text that prompts them to enter the barcode number. Just to echo other comments – much prefer the second option (thank goodness you were forced into the design change by the form of the devices). It’s interesting the limitations on scanning the barcode, and the necessity of having a keyboard for manual input. It would be interesting to know the percentages of manual versus scanned, and those percentages across time (i.e., does input move more to scanned as capabilities develop). I think there are some closed source barcode scanning apps that work with the fixed focus cameras – they must do some image cleanup before processing. Who knows, maybe the iPad 3 has a better camera :-). Btw are you doing checksum verification? Hi Steve. The keyboard is just for cases when a camera isn’t available or suitable. We are looking at how useful smart phones are for capturing citations and iOS doesn’t provide a USB socket. Yes, we do checksum verification. It happens on the phone when scanning a barcode with the camera. It also happens server-side before we search with the number. We have a server side component that acts as a proxy to bibliographic databases.